JICA-RI Director Tambo Attends Events on Land Mine and UXO Removal in Japan, U.S.
"Land mines and UXO are an impediment to development itself," says JICA Research Institute Director Ichiro Tambo. Tambo participated in and spoke at a pair of events in Japan and the United States in April related to the removal of land mines and unexploded ordnance (UXO). The purpose was for the Cambodian Mine Action Centre (CMAC), Lao National Unexploded Ordnance Programme (UXO Lao), the Japan International Cooperation Agency and other stakeholders to deepen their discussion of their activities related to land mine and UXO removal and South-South cooperation and to disseminate information. The public seminar "Institutional building in landmines and UXO sectors and south-south cooperation- Regional collaboration between Cambodia and Lao PDR" was held at the JICA Ichigaya Building on April 21, 2015. Forty-five people, some from JICA, attended. 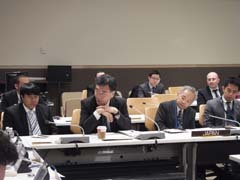 The seminar "Bridging towards the mine free world -South-south cooperation in mine/ UXO action" was put on jointly by JICA and United Nations Mine Action Service at U.N. Headquarters in New York on April 23, 2015. Some 50 interested parties from the U.N. and various countries attended. According to the U.N., landmines kill 15,000 to 20,000 people annually and they are in the ground in some 78 countries. Under the Ottawa Treaty drafted in 1997, 162 countries have been working to clear all of their mined areas. The Japan International Cooperation Agency's work on land mine and UXO removal began with assistance to strengthen the capacity of CMAC in 1998. This effort has involved sending experts to teach about such areas as information system technology and resource management, and helping to procure metal detectors and heavy machinery for removing vegetation and ordnance from minefields. CMAC has subsequently begun spreading what it learned through South-South cooperation, first to Colombia (2010-11), and then to Laos (2012-2014) and Angola (beginning in 2014). At the events, Tambo stressed three key points for institutional capacity building for land mine and UXO measures: leadership, ownership and partnership. He recently shared his thoughts on the events and South-South cooperation as an important tool for land mine and UXO removal. "The ability to live in safety and security is a major prerequisite to development, and it is important to bring about a situation where development can take place." he said. The removal of land mines and UXO requires expertise that is not easily acquired, and this expertise is a matter of life and death, Tambo said. "There is no margin of error in the removal of land mines and UXO, and Cambodia's CMAC said it has been involved in this work for more than 10 years and has experienced many hardships. Removal requires much time and expense, but I think this can be reduced considerably through South-South cooperation," he said. "Everyone agreed that South-South cooperation is a particularly effective tool in the removal of land mines and UXO, awareness of its effectiveness was increased. It exceeded my expectations," he said of the events. Tambo had high praise for Cambodia's South-South cooperation to Colombia and Angola. "When we developed countries provide technical cooperation, the recipient tends to think it can't do the same thing because it is in a different situation, and a merit of South South-cooperation is that it has no preconception that something cannot be done without help. It offers the encouragement that if Cambodia can do it, we can do it. It is because of the Cambodians' attitude that they are not teaching but rather learning that technical cooperation to Angolans and Colombians is going so well. South-South cooperation is not a mere slogan. It is extremely effective cooperation that fills the gaps left by technical cooperation by developed countries."